I've got some exciting news to share today! I've joined the Play Date Cafe Challenge Design Team! You're going to love the creations by these talented designers. As the Play Date Cafe begins a new season of designers, we also say goodbye to Julie Campbell, who has been on the design team for the past 4 months. 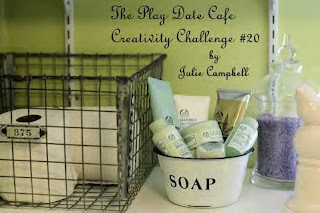 To celebrate Julie's achievements and the new design team, Play Date Cafe is having a BLOG HOP! If you came here from Julie's blog, you are in the right place, didn't Julie pick a great color inspiration for this weeks challenge. This weeks colors are Lavender, White and any shade of Pale Green. 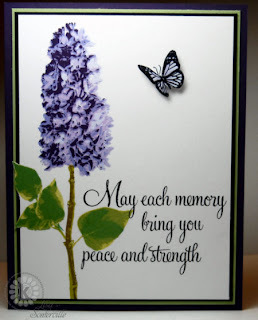 I thought the Multi Step Lilacs from Kitchen Sink Stamps were just perfect for this weeks Challenge. The Lilacs were stamped in shades of Purples, and the leaves in shades of Green (see color recipe below for steps). I added the sentiment from Kitchen Sink Stamps Words of Comfort & Joy in Black Memento, the Butterfly is from the Multi Step Hydrangea. If you didn't start at the beginning, hop over to The Cafe to see what you can win. Become a follower of The Play Date Cafe...easy-peasy! Play along with this week's color challenge - All the details on how to play are on the sidebar in The Cafe. This card is gorgeous!!! absoultely gorgeous!!! So great to have you on our team in The Cafe....we look forward to your creativity and inspiration! Hi Lisa! First of all, congratulations on being chosen for the Design Team! You will love working with Julie and Sarah--and all the others, too! Your work is just beautiful--glad to see more of it on your lovely blog! Have fun with the challenges--can't wait to see what you'll be creating! I happen to love old fashioned flowers, this is lovely!!! Beautiful card, love the flower on the white, it pops from the page. Congratulations.... your card is so pretty ..
Lisa, welcome to the team. Your card is lovely,what a great stamp. Your lilac is so pretty!! This is gorgeous, Lisa!! The flowers and leaves just pop off the crisp white background!! Looking forward to working with and getting to know you better! This is beautiful! Love the stamped lilac and the butterfly! I've admired your work for a while, those Kitchen Sink Stamps are pretty interesting, will have to check them out.Congrats on making the team. Gorgeous card. I love the way you've done the little butterfly, beautiful. Congrats! Lovely card... I love the flower. Looking forward to being on the team with you! Congrats Lisa! ...and such a beautiful card, luv the colors. Your lilacs are so vivid, so pretty! And the leaves are beautifully colored too! Congrats on the new DT! I'm definitely going to be trying this challenge, I love those colors together. Simply gorgeous! Love that butterfly! I love this stamp! It may be a new purchase for me. Congrats on joining the team, I can't wait to see your creations! Stunning card, really love it. You do such a beautiful job with the lilacs. Congratulations on joining the design team. I think I'm actually a Lisa follower. Did you know you have groupies! Love your card! It is so striking in its use of white space. Love your card and love the play date site always great inspiration. Not sure if my comment worked so am leaving another one. Love your card and love the play date cafe. Congrats, Lisa!! I love your beautiful lilac creation, and I'm looking forward to your work with the PDC challenges! Stunning card!!! Love the soft colors - perfect to comfort those who may have lost a loved one. What a comfort and totally gorgeous! This a stunning card. I love the variation of the colors you used and the stamp is awesome. Congrat's on joining the team. I truly am looking forward to seeing your work each week. I love your card- the butterfly is absolutely gorgeous!! Congratulations on making the team. I am sure you will get lots from it and really enjoy the position. Great make this week. Looking forward to working with you on the pdcc design team :) Love this card, the lilac is so striking. We used to have a lilac when we lived in our other house and I do miss it! Wow, it looks like a photo! I'm sure you will be an inspiration here. Wow what a beautiful flower, did you colour it yourself. Lovely. Wow love your stamping, I can never get the hang of over stamping. Lovely sentiment too. What a beautiful card! I love the simple design - it really makes the images and the sentiment stand out! Your blog and designs are wonderful! I am signing up to follow. Please stop by Create With Joy when you have a moment. I'd love to meet you, and would love to welcome you to my family of Kindred Spirits as well! Your lilacs are so gorgeous. Love those flowers this time of year. What a stunning card! Your work is beautiful! Beautiful card - love the stamp! LOVE this card!!! It is sooooo beautiful! This card is so pretty. Nice and clean and simple, I love it. I always see amazing cards that spark new ideas for me, but I also love find new stamp sets to use. I'm definitely going to check out the Kitchen Sink stamps. Thanks! Hi, Just stopping by to say hi while participating in this blog hop. I can't wait to get to know you through your blog better! It's lovely. Stopping by to say hi while on the blog hop. Can't wait to get to know you and your blog better. Hi Lisa, I'm feeling a bit like the white rabbit here as I'm so late doing this blog hop! Congratulations on your PDC DT news. Beautiful card you've made and looking forward to seeing more of your creations.